They say that before you embark on a journey of revenge, you should dig two graves. This is why Metal Gear Solid V: The Phantom Pain has two endings. At the climax of the game’s first chapter, Venom Snake and his Diamond Dogs take their revenge on the villainous Skull Face and the credits roll—but then the game’s second chapter starts. Snake’s advisors grow cagey, change their minds about who their real enemy is, and continue accepting meaningless gun-for-hire work. Over time, the group disintegrates. Members are exiled or run away, and an outbreak of untreatable and contagious parasites forces Snake to slaughter many of his own soldiers. Finally, Snake learns that he’s not the legendary Big Boss at all but a hypnotized body double. By the end of chapter two, Snake has lost everything: his purpose, his friends, even his identity. Here the game ends again, burying Snake in the proverbial second grave. This is how the game ends as it exists now, but it wasn’t the story’s intended conclusion. Appropriately, given its subtitle, The Phantom Pain is missing parts. A 51st and final episode was cut from the game due to time and budget constraints, but a video depicting the unfinished content was included as a special feature in the game’s collector’s edition. That lost ending would have significantly changed how the story and its themes played out. Not only would it have tied off plot threads that are left hanging in the existing ending, but it also would have elevated The Phantom Pain from a comparatively straightforward anti-revenge cautionary tale to a much richer meditation on selfhood, legacy, and truth. To say MGS5’s ending is abrupt would be too kind—episode 51 was so vital to the story of The Phantom Pain that it’s almost more accurate to say that without it, the game doesn’t have an ending at all. In the lost episode 51, the Diamond Dogs find Eli—the boy warlord cloned from Big Boss, the legendary soldier whose body double you’ve been playing as throughout Phantom Pain, unbeknownst to you until the very end—and the Metal Gear he stole from them hiding on an island that’s been contaminated by deadly lab-grown parasites. This episode would have climaxed with a battle against Metal Gear Sahelanthropus, the nuke-wielding bipedal tank, and Eli, who reveals his patricidal motivation before the battle begins: “You don’t get the last word, Father. I’ll break the curse of my heritage.” After Snake’s victory, the Diamond Dogs reclaim Sahelanthropus, and the humiliated Eli lashes out at Venom Snake—“I’m not me. I’m just a copy of you.”—not realizing he isn’t the real Big Boss. Snake, pitying Eli and recognizing himself in the child’s identity crisis, leaves him a handgun with a single bullet, expecting never to see him again. Instead, Eli escapes, living on to become Liquid Snake, one of the series’ recurring villains. This final confrontation between Venom Snake and Eli is what the entire episode, the entire game, and potentially the entire series was meant to build toward. At the end of chapter 2, Snake listens to a recording describing Big Boss’ plans for him. 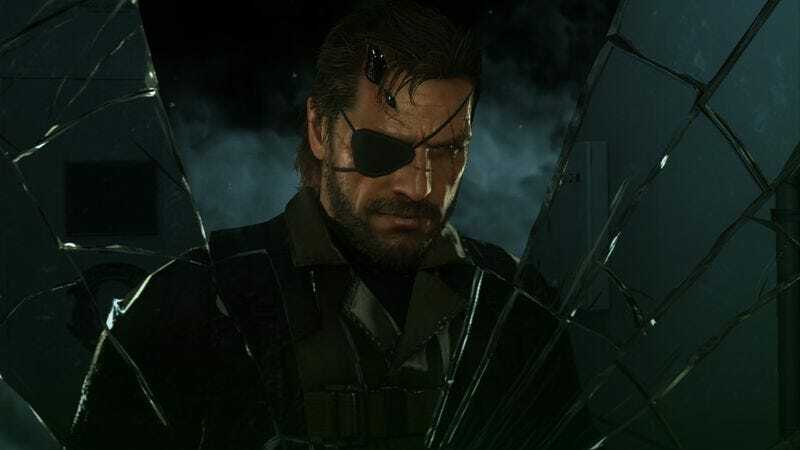 He stares in a mirror and perceives himself in many different ways—his original self, his emaciated form after awakening from his coma, a blood-drenched demon—then shatters it, symbolically surrendering his identity entirely to Big Boss. In the existing ending, he does this for no discernible reason. It continues the Metal Gear Solid tradition of meditating on identity, but it’s an incomplete thought. One man has been transformed into another through surgery and hypnotherapy, and he accepts this new role almost instantly and without motivation. That complacence minimizes the series’ depiction of individual identity as something shaped by countless factors that interact in complex and unpredictable ways. It’s only in the deleted episode 51 that we see the moment when Venom Snake truly subsumes his identity into Big Boss’. It’s the presence of Eli, who resists his assigned role as Big Boss’ successor, that motivates Venom Snake’s surrender. When confronted with the defeated child’s pitiful tantrums over being shackled to Big Boss’ legacy, Snake rejects Eli’s denial and finally accepts his new identity. The moment Snake mocks Eli’s spurning of his heritage—“That’s right. Don’t blame yourself. Blame me.”—is the moment he both embraces his role as Big Boss’ copy and starts to become the villain that will later surface in the original Metal Gear. Without Eli’s defeat and subsequent outburst, Snake never sees how fruitless it is to resist Big Boss’ machinations, and how undignified it looks for his tools to insist on their own individuality. Over the course of Metal Gear Solid V, the credits roll dozens of times—every mission ends with a credits sequence, like a TV show. Despite all these endings, the story itself never truly concludes, never builds to a single thematic point. The story of The Phantom Pain, of how one man’s identity can be utterly replaced with another’s, doesn’t work unless Venom Snake’s story is explicitly contrasted with Eli’s. It takes all three characters—Big Boss, the Father; Eli, the Son; and Venom Snake, the Holy Ghost—for the game’s story and its themes to properly coalesce. Without this final confrontation, the game instead concludes on a hollow twist ending that has little to offer besides shock value. Also lost, incidentally, is the symbolism of an ending where two fakes fight over Metal Gear long after the original legend has fled to do something he finds more interesting. Konami announced Metal Gear Survive this past August. The series’ creator, Hideo Kojima, is not involved in its production. Purchasing Metal Gear Solid V: The Phantom Pain via Amazon helps support The A.V. Club.